Atari has released the first gameplay footage of RollerCoaster Tycoon World, the multiplayer-focused addition to the RollerCoaster Tycoon series that's coming out later this year. 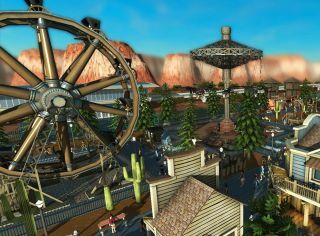 The new game will work much like its predecessors, but players will have the ability to visit other parks, share rollercoaster blueprints, and team up with other tycoons to form a worldwide theme park company. For the first time in the series, the tracks and terrain in RollerCoaster Tycoon World can be fully manipulated in 3D. Parks can be built in Forest, Island, Urban Sci-Fi, and Canyon settings, and personalized with different rides, attractions, shops, decorations, and "custom scenery" that will be released as a free, post-launch update. And of course, players must manage their parks once they're opened to the public, by setting admission and ride prices, hiring staff, and ensuring the rides don't break down. Or, on the other hand, ensuring that the rides are purposely designed to do horrific things to unsuspecting rubes. Which is my favorite thing about this trailer: It's exciting, it's upbeat, it's pretty, the first-person rollercoaster rides look great, people are having a grand old time, the "sky's the limit," as it says—and then the sky literally becomes the limit as a train of cars goes spinning off through the air. Whoops! I think we all know how this is going to work out. RollerCoaster Tycoon World is set to come out later this year. Details are up now on Steam.